Hello friends. I went to lunch at Jack's Wife Freda, in New York City, with my niece back in August. I posted about this awesome restaurant recently. 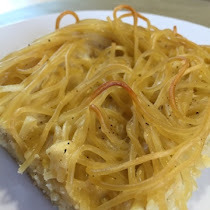 If you missed that blog post, than you can read about my luncheon HERE. 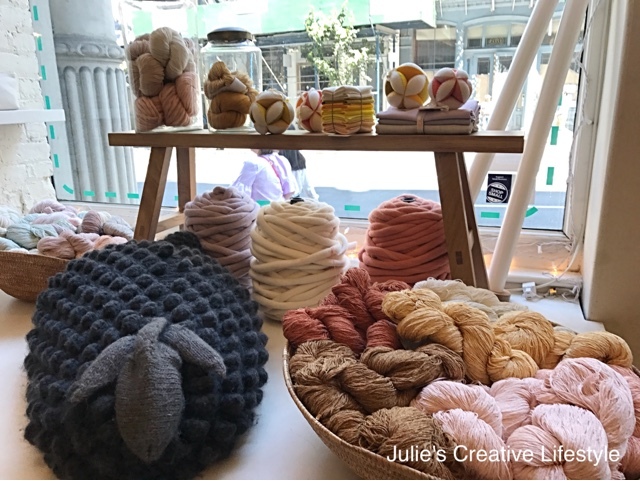 We both decided after lunch to go yarn shopping at Purl Soho in New York City. If you are not familiar with this store than you can read about it HERE. My niece also loves yarn, and she likes to knit scarves, hats, and shawls. We had so much fun visiting the store and when I asked if it was ok to take photos of a few things, they said yes! 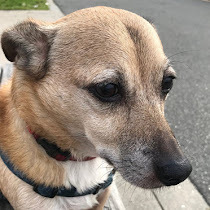 Well, I took a lot of photos and I hope you enjoy looking at them. The wall above and the window below were displayed with books, knitting kits, all kinds of colorful yarn, and fun creations. On the opposite wall, there are large shelves, filled with so much fun and colorful yarn to choose from. I spent a while looking at all of the yarn displayed on the shelves, and I happily decided to treat myself to some pretty yarn. I bought three skeins of this yarn Alpaca Pure, in the color Gray Fig, to knit a scarf using the seed stitch. The seed stitch is a nice stitch, but you have to be careful and pay attention as not to mix up the stitches. I did not realize when I was paying for the yarn that I mistakenly picked up a skein of yarn that was $26, thinking that it was $19. This will be a splurge present for myself when the scarf is finished. I could of bought two skeins of yarn, but I am going to make either hand warmers or a cowl with my left over yarn. 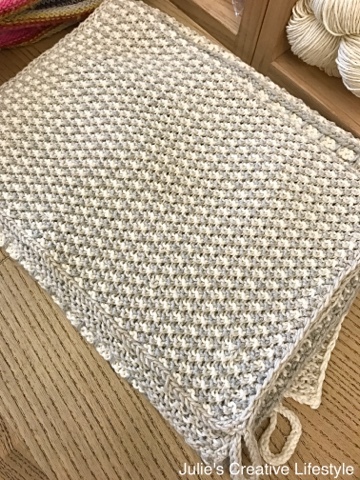 I have not made a scarf for myself in a long time, because I almost always donate my creations to the church sale in November each year. Below are some knitted hats on display. Aren't they cute? 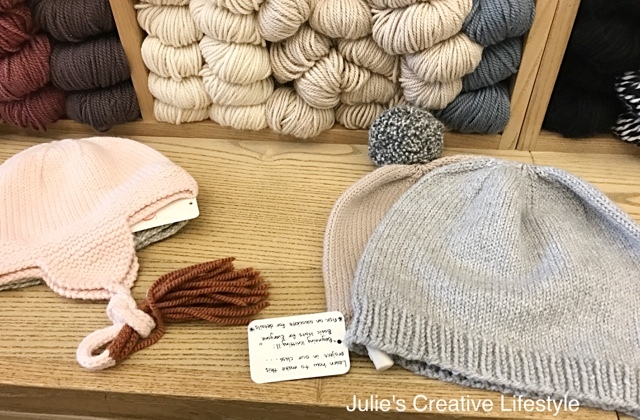 I love the beautiful stitching on the knitted grey and pale pink hats. The store has some really neat books. This one below is for arm knitting. It sounds like a really interesting craft to try out. 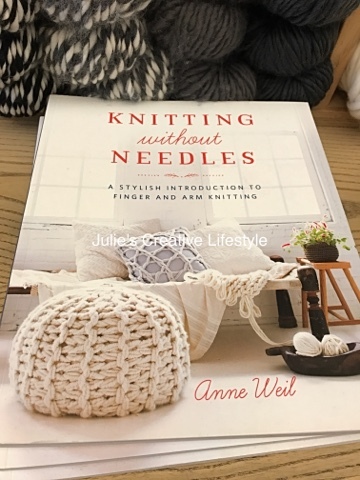 I think this is great for people who don't know how to knit with knitting needles. 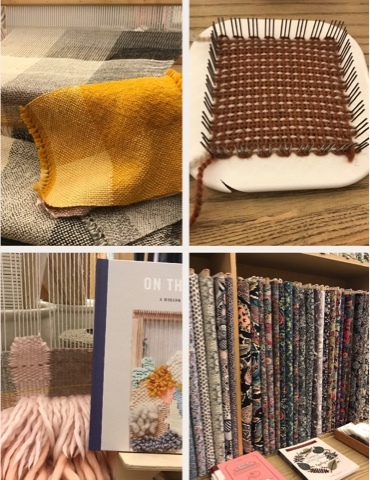 Weaving on looms seems to be all the rage right now. Displayed below are small weaving looms. There were so many shelves full of pretty fabrics to choose from for sewing projects. I thought the colorful string looked like fun to make bracelets. The store has all kinds of different crafts to choose from. They also have a huge wall to buy different knitting and crochet items, pom pom makers, embroidery, sewing, and weaving items. Below are some pretty shaped pot holders that were on display. I really love the colors of the cream and grey pot holders. 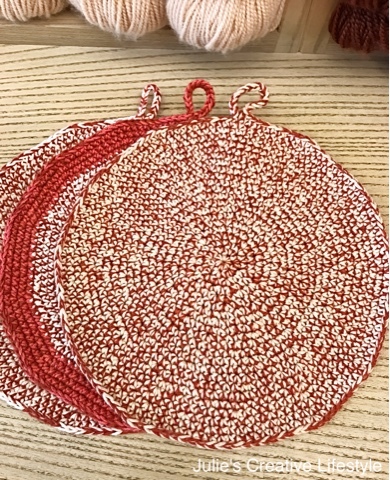 Don't these red and white round pot holders look awesome? 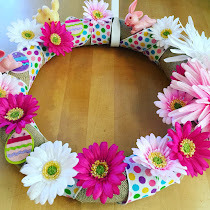 I am so inspired to make these round pot holders. 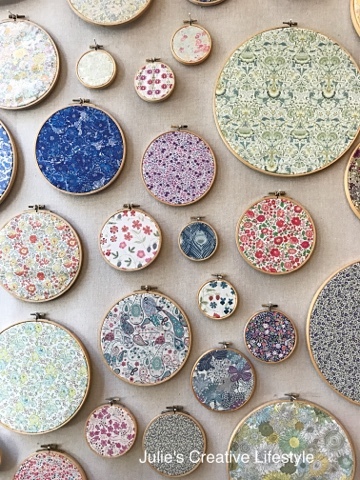 If you visit Purl's website HERE, than you can see all of their free patterns. They have the pattern to make these potholders there. I have never made a shopping bag before, but I love the one below that they had on display. 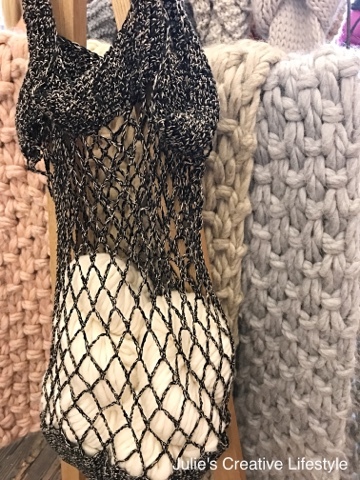 I think those scarves made with the thick yarn would be fun to make too. I love using thick yarn and large knitting needles to make cowls and scarves. I bought all of that yarn, and then the funny thing is my niece said that she wasn't going to buy anything at all in the store. Well, I said that you have to since you came all this way, and you love yarn! P.S. My niece bought two skeins of yarn to knit a hat. The store provides great service, which is that if you buy yarn then they will wind it for you for free. You just can not return the yarn after that for any reason. 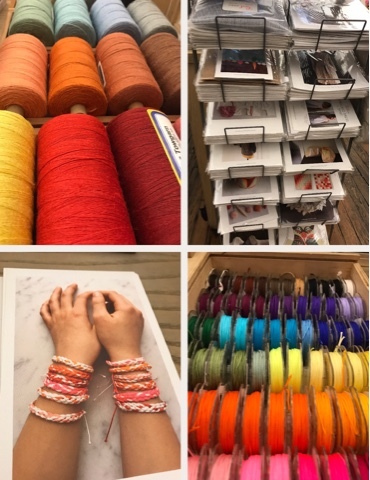 I can't wait to visit Purl Soho again for yarn shopping and lunch in Soho. I hope I've inspired some of you to do some fall and winter crafting. Do you have anything on your needles? 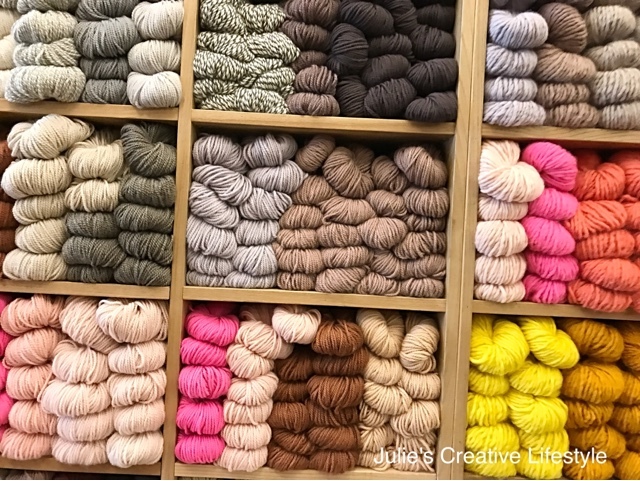 Do you have any yarn shops in your area that you love visiting? Thanks so much for stopping by. I hope you enjoy the rest of the week and weekend. Jess and I will see you all back here on Monday for our Cooking and Crafting with J & J Link Up! I keep telling myself that I need to learn to knit and crochet because I love yarns and all the things you can make using yarn. This looks like such a fun store. I love how the yarn is displayed. So pretty! Thanks for sharing. I will tell my daughter about this place. Sounds like you had lots of fun with your niece. The yarn is so pretty, you must have been in heaven. Thanks so much for sharing. Most of the yarn shops here have gone out of business. Such a shame. Wow, what a neat shop! So much fun visiting a place like that! Sounds like a fun place to shop. I wouldn't know what to do with most of the stuff but I love looking at it. There is a cute yarn shop like that a few towns over from me. I love looking at the wall of colorful yarn. I have heard of this shop, Julie. It looks like a wonderful way to spend an afternoon. 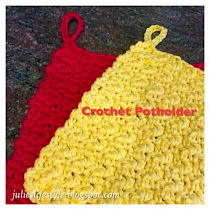 I love the red potholders and the rectangular ones, too. I think I could get into a ton of trouble (and debt) there. Julie, I just returned from a trip to NYC. 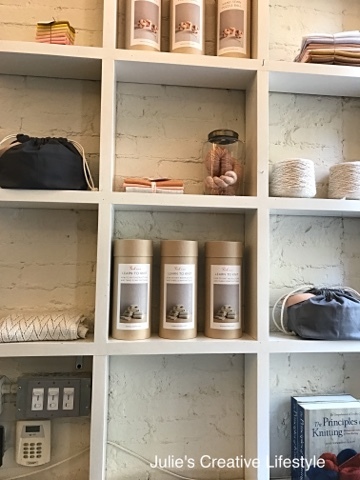 I don't knit, but I love a beautiful store of yarns. I'm adding this to my list. Thanks! I've heard of this store and glad to see that it does not disappoint! Beautiful Julie! I don't knit or crochet, but still love the gorgeous colors and types of yarn you see on display! Thanks for sharing with SYC. What a beautiful store! It almost makes me want to take up knitting! 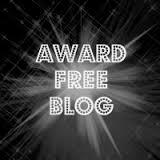 I'll be featuring your post tomorrow night at Best of the Weekend! What a fun weekend and I love all those yarns. 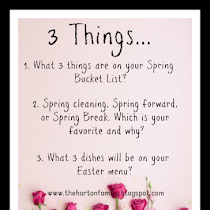 Thank you for sharing at Dishing it and Digging it link party and you are one of our features this week. Hi Julie! This looks like such a fun place to shop. Thank you so much for sharing with us at Dishing It & Digging It & congratulations on being featured this week!